First, let's recap the main takeaway from part 1: Name your chapters to denote what happens in them. The list can (and does, for me) end up serving as your outline, which makes it incredibly easy to navigate your book later. Nice and tidy, right? Now, as an outline this may look a bit light. If you didn't know Star Wars you wouldn't be able to get the full gist of the story from this. That's okay. This is for your use, not to communicate the story to others. And, once it's fleshed out with Scenes inside these chapters, the details, if needed, will emerge. For you pantsers out there, it's perfectly fine to NOT do this ahead of time. Just create a new chapter, write it, and when you're done name the chapter with a terse summary. Last note on this: If you look at these chapters, I've tried to have the words summarize what happens at the END of that chapter. This way, every time I start writing a chapter I know what my goal is, and I can have fun getting there. It works for me, but as always your kilometerage might vary. 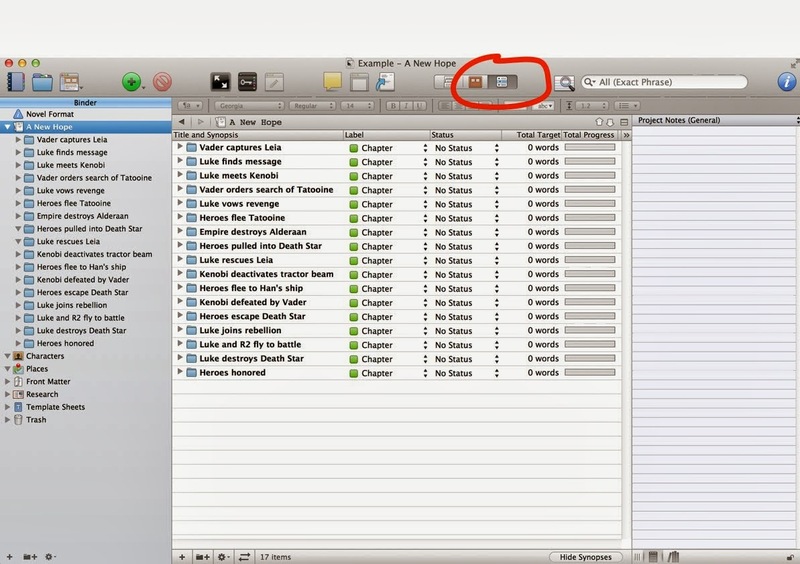 Scrivener gives you a lot of different wants to flag things for later reference. And because of that it can be easy to get overwhelmed by these options, and equally easy to go overboard using them. So my main piece of advice here is KISS: Keep It Simple, Stupid. You don't have to use all these features, and indeed I don't. I started out adding keywords and meta-data all over the place, but in the end I found I wasn't ever making use of them. Your technique will likely evolve, too. For now, we'll keep it simple and just make use of Labels. In the screenshot earlier, you can see that each Chapter, by default, gets the label of... Chapter. Personally, I think this is next to useless. For me, what was useful when writing my Dire Earth novels was to know which character's POV was used in each chapter. The reason's I'll get into in a second, but first let me show you how to change these. 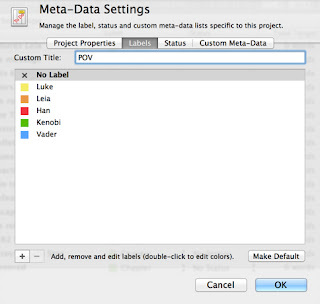 First, click the little up/down arrow next to one of the "Chapter" labels and then select "Edit..."
Change the custom title from "Label" to "POV". 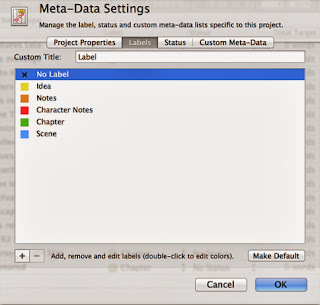 Then, edit the label names themselves (double-click on them) to be the main characters in your book. I also made "No Label" the default. 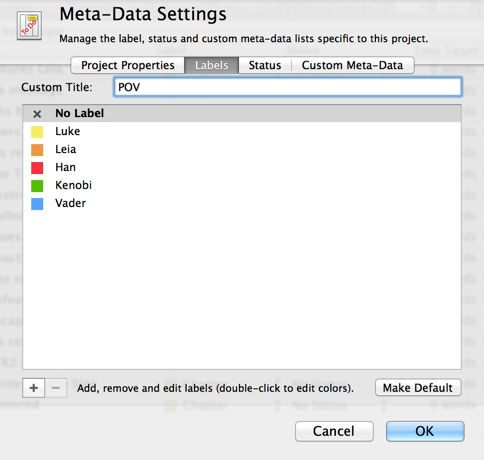 Now, Star Wars itself might not be the best example for using POV as the label we care most about. But for my novels POV was very important, so let's just pretend it matters here, okay? Okay. If you're writing a mystery, maybe change the label column to "Clues" and keep track of what is learned when. Or if you're writing a 1st person story of emotional journey, you could denote the mental state of the main character. Again, this is all to help you identify issues like pacing or focus. In the mystery example, you might find at this stage that you've got a large section in the middle of your book where no clues are given. Whether or not that's an actual problem is something for you to decide. Follow your gut! Now, Scrivener does offer other ways to do this. In addition to label there's status, keywords, and meta-data. For me, just using labels is really enough. I've done other things like adding keywords for locations and meta-data to note every character that appears in a given scene, but honestly I hardly ever used these. For the more detail oriented writer, you might LOVE this sort of thing, and I also suspect some of you are already looking at this POV label and thinking it wouldn't help you at all. The main thing you need to realize about using these is that once setup you can SEARCH based on them. It's easy, just click the little down arrow next to "Search" and tell it you only want to search labels. 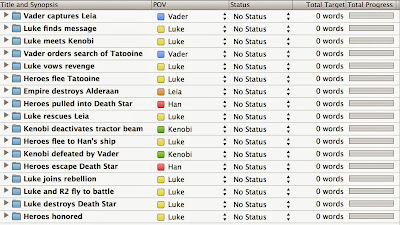 Search for "Luke" and you'll find every chapter where Luke is the POV character. 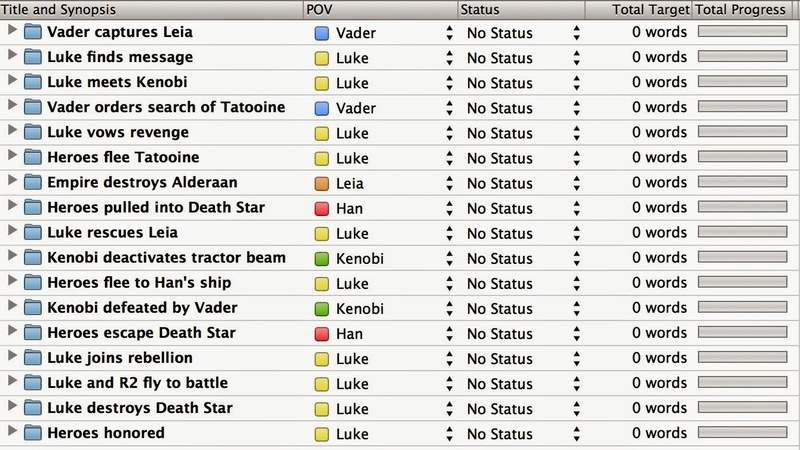 Again, perhaps not so useful with this Star Wars example, but imagine if you had 60 chapters with 10 different POV characters. 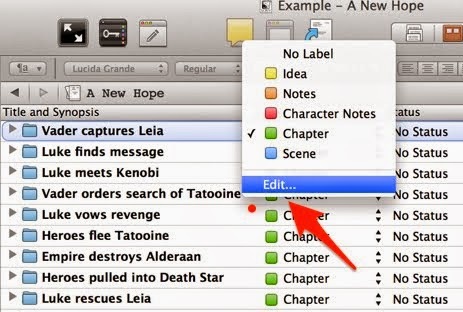 Using this, you can instantly get a view of your book from just that character's POV. Used well, this can be very, very powerful tool. Part 3 of this series will cover using comments as an amazing way to keep track of every little idea or correction or concern you think of as you write. Nice intro to labels; I've done this myself to try and balance PoV between antagonist and protagonist. That ended up being a mistake, since the antagonist needed to be more of a boogieman through most of the story. I noticed a typo you might want to correct: "just click the little down error next". That's "arrow", I believe. Fixed the typo, thanks for pointing it out! As for labels -- yes, in my view POV is only useful if you're definitely planning to write from at least 2 if not 4 (or 10!). I guess the main point to impress is what would be useful for you to know at a glance. - to track a story with multiple timelines. - to track which plot point the chapter is hitting (ala Save the Cat or something similar). - to denote where the chapter takes place if your story moves around a lot. - perhaps track the style of the chapter . (introspective, action, discussion, etc.) to make sure you're not stringing too many action scenes together and what not. And, I should add, you don't have to label everything ahead of time. It might only be after a first draft that you want to go back through and do this kind of analysis. Thanks for the interesting and informative posts, Jason. In my latest WIP, I am using labels to denote where each chapter takes place, as one of your examples suggests. I'm looking forward to reading your part 3 of this series of posts. Thanks! Hope to have it up this week! Cheers! What a great way to organize and plot. Thanks so much for sharing, and I'm very much looking forward to Part 3! 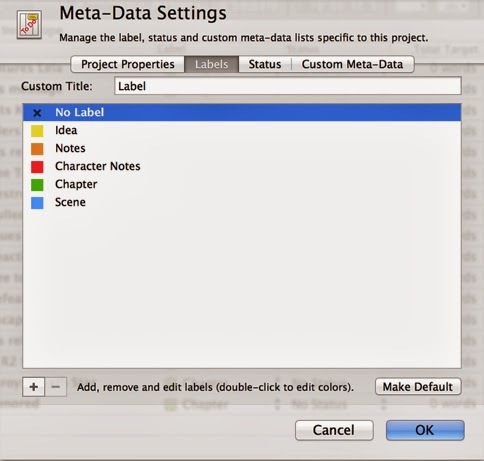 Jason, is there a way to save the labels from one project to apply to a new project? I can remember the labels, but it seems a waste of time to pick the colors all over again for each project. I have a different color for illustrations, quotes, etc. It would be nice if there was a way to get to come up with every new sermon project. Thanks! I haven't tried this myself, but I think the best option is to get a project setup how you like it, and then save it as a template. Now when you start a new project, instead of picking one of the built-in templates like "novel", start with the template you saved. Wow-thank you so much for these posts on Scrivener! I have just started using it and was beginning to feel overwhelmed. Your advice is simple and easy to understand. Kudos and best of luck to you in your writing! I am just on my way to start using Scrivener and right now after just reading you'r first two post about Scrivener have learned me more then the whole tutorial. I can clearly see the benefits and how convenient it will all be when I start my new story and right now I will go to your final third piece and learn some more good stuff. 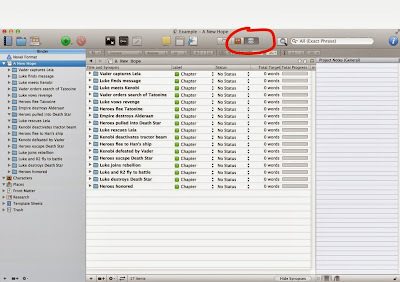 I've been using Scrivener since it was Windows beta, and hadn't thought about how these details can help keep the writing more organized and consistent. Thanks for taking the time to post this for us. Roger - sorry, no, I haven't made a Part 3 yet. I'm waiting for Scrivener 3.0 to come out (hopefully this year), at which point I will update all my tutorials and make more.